48 www.coalage.com January/February 2019 legally speaking MSHA's Blind Spot on Powered Haulage Safety by brian hendrix Last June, the Mine Safety and Health A d m i n i s t r a t i o n (MSHA) published a Request for Infor- mation titled, "Safety Improvement Tech- nologies for Mobile Equipment at Surface Mines and for Belt Conveyors at Surface and Underground Mines." MSHA asked stakeholders to submit "[b]est practices, training mate- rials, policies and procedures, innovative technologies, and any other information they may have to improve safety in and around mobile equipment, and working near and around belt conveyors." MSHA said "[m]ining safety could be substantially improved by preventing accidents that involve mobile equipment at surface coal mines and metal and nonmetal mines and belt conveyors at surface and underground mines." In the RFI, MSHA noted that "[s]ince 2007, 61 miners have been killed in accidents in- volving mobile equipment. MSHA inves- tigated these accidents and determined that contributing factors in many includ- ed: (1) no seat belt, seat belt not used or inadequate seat belts; (2) larger vehicles striking smaller vehicles; and (3) equip- ment operators' difficulty in detecting the edges of highwalls or dump points . . ." No one loses when MSHA spends time developing, collecting and sharing information about the most effective practices, policies and equipment that have been developed, tested, are using, etc. to improve powered haulage safety. MSHA has posted all of the information it received to an online docket. Time spent reviewing the information there will be time well spent. It is a great repository of timely information and ideas about pow- ered haulage safety. MSHA has also cre- ated a page on its website for its Powered Haulage Safety Initiative, and it is also a valuable repository of information. MSHA's RFI process will be worthy of applause if MSHA focuses on sharing and promoting the best of the infor- mation it has obtained. 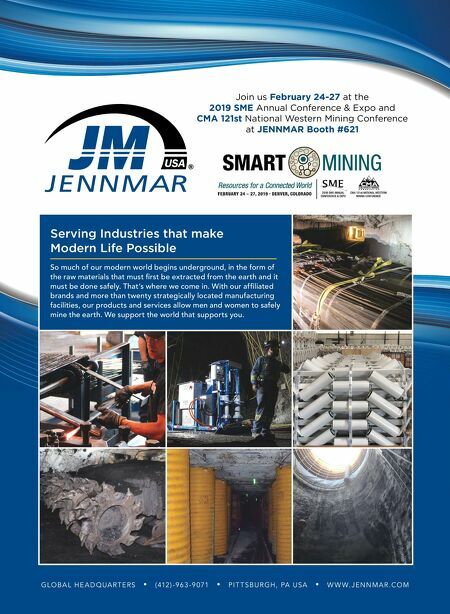 MSHA is surely right that we can improve the safety of powered haulage in mining. However, the evidence MSHA uses to make this claim is suspect. MSHA's claims are based on MSHA's accident investigations. However, MSHA does not and will not identify human er- ror or behavior as a potential root cause of any accident. When MSHA investi- gates an accident, it will always assume that the accident was caused solely by management failure(s). Per MSHA's Ac- cident/Illness Investigations Procedures Handbook, "[t]he root cause identifies the reason that the mine operator's rules, policies, procedures or programs failed to ensure that employees took appropriate actions to prevent the indirect causes that led to the hazard or unplanned event." As a result, MSHA's conclusions about the cause(s) of an accident are of- ten incomplete, erroneous or worse. For example, one of the 61 fatalities MSHA refers to in the RFI involved a 2007 haul truck accident. The haul truck driver did not maintain control of the vehicle, and he was not wearing his seat belt when the accident happened. He had more than 40 years of mining experience, was a model employee and an advocate for seat belt usage. When the accident oc- curred, he was traveling approximately 15 mph up a 10% grade with a loaded truck on a straight section of the haul road. The truck drifted gradually to the right, went through/over a berm and over a highwall. From the evidence, it did not appear that the driver braked or attempted to steer out of the turn. MSHA's accident report identified two "causal factors" for the accident. First, "[t]he truck driver did not maintain control of the truck he was operating." Second, "[m]anagement policies and procedures did not ensure that the truck driver wore his seat belt when operating the truck." The haul road — including the berm — was in good condition, and there was nothing wrong with the haul truck. Speed and weather weren't fac- tors. Why did the haul truck driver lose control of the truck? To most of us, that would be a key question that you would want to answer. Not MSHA. MSHA's re- port doesn't answer that question. After the accident, MSHA deter- mined the driver wasn't wearing his seat belt at the time of the accident. The mine operator had a seat belt policy, it required miners to wear seat belts, and it trained miners to use them. The fatal- ly injured miner was very experienced, properly trained and he was a seat belt advocate. MSHA's report is silent as to why this miner wasn't wearing his seat belt at the time of the accident. Of course, there was an explanation, but MSHA refused to include it in its re- port. Put simply, the miner almost cer- tainly experienced a medical event prior to the accident. The evidence indicated that he lost consciousness before the haul truck traveled over the highwall. This is just one example out of many. MSHA accident investigation reports are often incomplete, erroneous or worse. MSHA knows or should know this. Yet, MSHA continues to use these accident reports to inform its policies and rules. The point here is that we can do a lot to improve powered haulage safe- ty. MSHA is right about that. However, we won't get where we want to be if we don't acknowledge and work to address the role miners play. 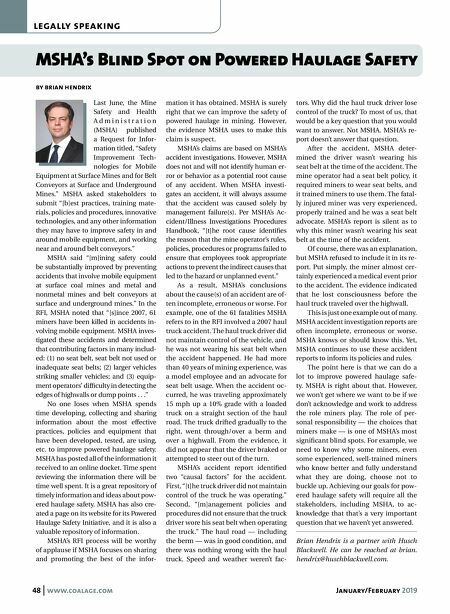 The role of per- sonal responsibility — the choices that miners make — is one of MSHA's most significant blind spots. For example, we need to know why some miners, even some experienced, well-trained miners who know better and fully understand what they are doing, choose not to buckle up. Achieving our goals for pow- ered haulage safety will require all the stakeholders, including MSHA, to ac- knowledge that that's a very important question that we haven't yet answered. Brian Hendrix is a partner with Husch Blackwell. He can be reached at brian. hendrix@huschblackwell.com.